Marigolds conjure up memories of cheery orange and golden blooms that last throughout the summer and are a staple in all old-fashioned gardens. Whether planted in containers, used in masses in annual beds, tucked between perennials, or planted between the rows in vegetable gardens, marigolds remain one of the best sources of long-lasting summer color. Marigolds present many choices for use in the garden, because they come in so many heights, flower shapes and colors. Heights range from six inches to three feet. Flower shapes vary from single to frilled, to massive round balls. Many shades of yellow and gold, orange, ivory, mahogany and bicolor blooms are available. The African marigolds contain the tallest varieties. They're the ones with the large pompon-type flowers, but some plants can be as short as twelve inches. 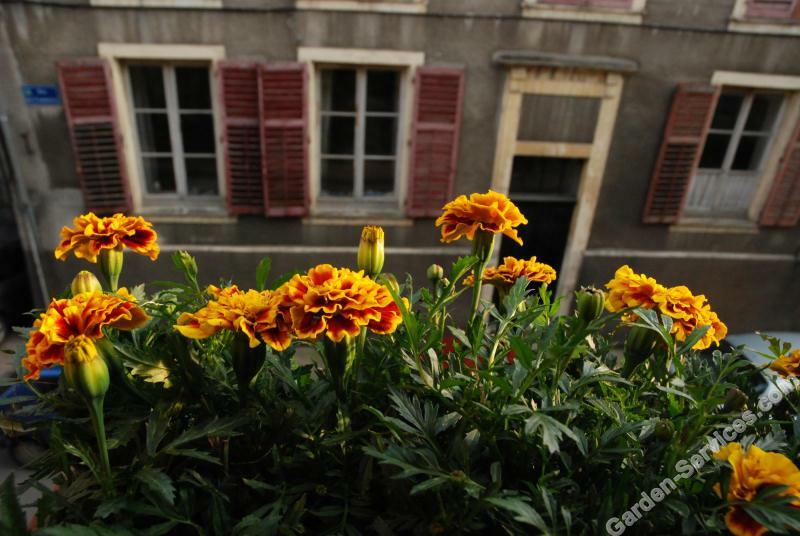 The French marigolds consist of the more dwarf varieties, growing to a height of six to twelve inches. Many choices are available, with both single and double flowers. Lemon Gem and Golden Gem are varieties of a species of marigold that produce a profusion of very tiny single flowers on bushy plants. The foliage is very fern-like and is more pleasantly scented than any other marigold. Marigolds can take lots of heat and full sun. They like well-drained soil and moist, but not wet, conditions. To keep them blooming all summer, remove spent blossoms. Seeds are easy to plant, bloom almost immediately, and can reseed themselves. These plants have very few pest or disease problems. Spider mites can occur during hot, dry weather, but squirting the foliage with water often can wash them away. Aster yellows is a viral disease that distorts the shape of the leaves and flowers, and turns the plants yellow. The virus is spread by leaf-sucking leaf hoppers that are difficult to control. Destroy and remove affected plants, but don't add them to the compost pile. Consider the marigold when browsing through nurseries or catalogs for bedding plants. There's a reason they've been around so long!